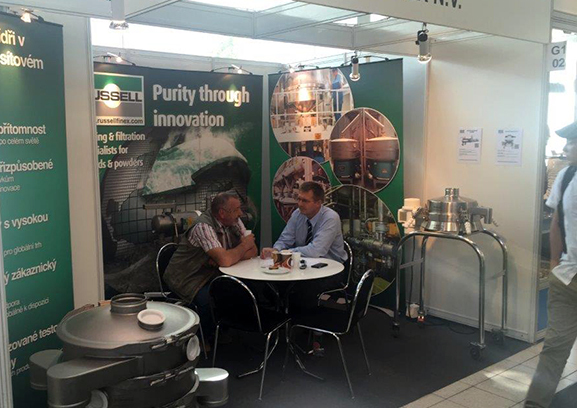 Russell Finex participated in a successful 57th edition of the international engineering fair MSV in Brno, Czech Republic. Czech Republic is one of the fastest growing economies in Europe and therefore it was no surprise this booming economy was reflected throughout the show. 10% of the 75,000 visitors came from other countries including Russia, China, Korea and Uzbekistan. The goal of MSV is to present the latest innovations and technologies and with a focus on the future, this edition put an emphasis on industry 4.0, the fourth industrial revolution. Topics such as 3D printing and robotics were focal points and leading technologies and innovations were presented at several conferences. Russell Finex have over 80 years of experience dealing with separation applications across a wide range of industries. At the show Russell Finex presented both separation and liquid filtration equipment including the Russell Compact Sieve®, the Russell Eco Separator® and the Self-Cleaning Russell Eco Filter®. Read the MSV press release to learn more about these machines displayed on the Russell Finex stand at MSV 2015. The next show Russell Finex will be participating is Solids (Schüttgut) in Dortmund, Germany. The show takes place on 4th and 5th of November. In the meantime feel free to view industries served and a range of trial videos to gain more insight on Russell Finex products or contact Russell Finex with any queries you have concerning your separation application.